In 1897, renovation of the church was undertaken, with an addition to the back of the original building, and with changes to the front of the sanctuary that remain to this day. George Hutchings, one of Boston’s premier organ builders, was commissioned to build a new instrument, his Opus 435, which still stands. Installation began toward the end of 1897 and was completed in the winter of 1898. 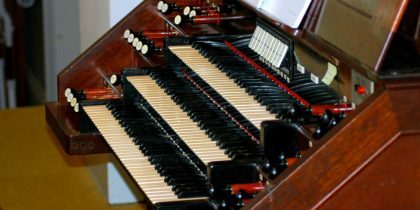 The Hutchings organ consisted originally of 27 stops distributed over three manuals and pedal, with couplers, a swell box, tremolo, and some mechanical registration assists. The original keyboard action was, and remains, mechanical, where wooden trackers run directly from the key to the valve under each pipe; the original pedal action was tubular pneumatic (now electro-pneumatic). The character of the instrument exemplified the late‑Romantic ideal. Its many unison stops, rather orchestral in nature and speaking directly into the room, would have filled the sanctuary with a mellow, warm sound. In succeeding decades, alterations have been made to the instrument, some in response to changing musical tastes and others in response to the normal mechanical wear on an organ in continual use. 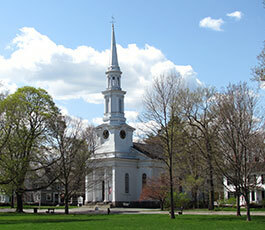 In 1958, Andover Organ Company, under the direction of then-partners Thomas W. Byers and Charles B. Fisk, carried out the first of what has turned into a series of renovation projects. Changes made to the instrument in the 1920s were removed, one of which was an enormous shutter wall between the organ chamber and the front display pipes. The sound, muffled and distant, returned instantly to its original fullness. Also, as part of this renovation, the pedal was prepared for expansion and the old, warped manual keyboards were replaced. Major tonal revisions were undertaken in 1962, again by Andover Organ Company, now under the direction of Robert Reich. Several ranks of pipes were revoiced to give more clarity and unity to the sound. New sets of pipes, called mixtures and designed to integrate within the existing pipework, were added to give more color and brilliance to the ensemble. Work in the early 1970s by organ builder Thad Outerbridge included additions to the pedal and extensive mechancial work. Further work in the late 1970s and early 1980s by Andover Organ Company added still more to the pedal and returned the Clarinet stop that had been removed in 1962, bringing the instrument to its current state. The organ now contains almost 1900 pipes, cylindrical and conical, wood and metal, flue and reed. The pipes are grouped into sets, or ranks, of 61 each for the manuals and 32 each for the pedal. 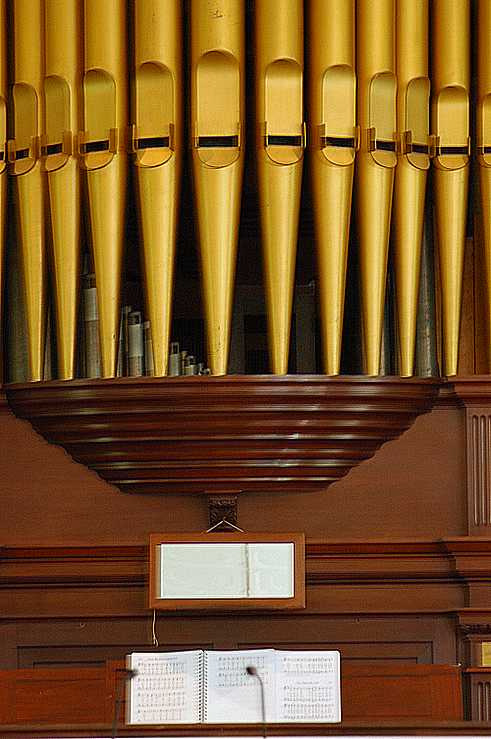 The largest pipe is 16‑feet long and about 15‑inches square, producing the lowest tone in the pedal; the smallest pipe, producing the highest tone in the organ, has a speaking length of about 1/2-inch. Of the 27 pipes visible at the front of the organ, 16 are real and “speak”; the other 11 are dummies that serve to fill the space symmetrically. Large pipe organs, like houses, require periodic major maintenance to ensure their preservation and future use. In 1996, with the approach of the organ’s 100th anniversary and the realization that about 25 years had passed since its last thorough going‑over and mechanical adjustment, major work was again undertaken by Andover Organ Company. Pipe work was cleaned and regulated, especially the reeds; wind leaks were sealed; moving parts were lubricated and adjusted. The tracker action was rebuilt with wooden tracker rods comparable to the originals, replacing metal rods installed in the 1970s. An action “floating” mechanism was installed to stabilize the manual keyboards against extremes of New England humidity and temperature. The effects of this work were readily apparent in the sound: a little brighter and more stable, due to the removal of dust and the pipes getting their full wind. Likewise, the touch is more even and sensitive for the player. The First Parish organ is a significant example of several generations of American organ building. Its tone is big, warm, and clear, while the reworkings and additions have increased its flexibility and tonal palette. Also significant is the fact that the basic structure and content of the original Hutchings is still present, and that this is one of the few late‑19th century mechanical‑action instruments that was not later electrified. With the organ celebrating its centennial in 1997-98, it continues to serve admirably in leading the congregational singing, in accompanying the choir, and in performing the great wealth of organ literature.